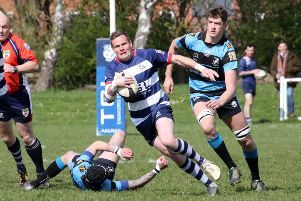 Banbury Bulls head coach Matt Goode will be looking to get back on track in the Wadworth 6X South West One East against Salisbury on Saturday. Bulls go into Saturday’s game against fourth-placed Salisbury on the back of their second defeat of the season, a 24-17 loss at Royal Wootton Bassett. Salisbury, meanwhile, hammered Wimborne 63-22 and are only three points behind Bulls so Goode knows exactly what is at stake at the DCS Stadium. Goode said: “Salisbury play a similar game to us, so hopefully that could play into our hands. “I’m looking for an improved performance, we need to stop our individual errors. We’ll go back to the drawing board and see where we’re going wrong but if we play like that this week it’s going to be a tough day at the office. Goode will be boosted by the return of skipper Ian Isham, along with Chris Phillips, Nick Pratt and Matt Brock but Bulls be without Tommy Gray and Sam Stoop so that will mean more changes.